Once upon a time there was a Golden Age of Freethought in the United States, roughly between the end of the Civil War and the start of World War I. That is, there were learned people who stood up in the public square and said out loud that Christianity was wrong. 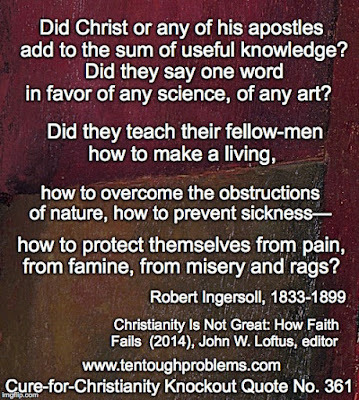 One of the most prominent freethought champions was Robert G. Ingersoll (1833-1899); he was a highly popular orator who toured widely in the U.S., and probably outdid Thomas Paine in his scathing criticism of Christianity. His legacy has been secured because his family took care to preserve the texts of his speeches (see The Ingersoll Times), and Susan Jacoby’s biography is an essential part of any atheist library. 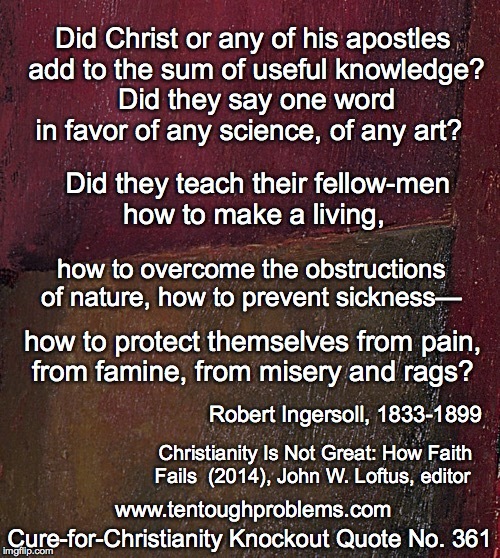 But how can anyone argue that the Christian church has been a failure—in the middle of the 19th century or now? There are probably dozens of metrics that show how successful the church has been—and continues to be. And so many Christians are so very proud of the good that the church supposedly does; they are confident that it is a force for good in the world. The history of wars, persecutions and bloodletting in the name of Jesus has faded from memory—or is naively dismissed as irrelevant to practice of the faith today. No, and probably for good reason: Jesus seems to have expected the imminent conclusion of human history. When I was growing up on the northern Indiana prairie in the 1950s and 1960s, we all knew about Mark Twain—how could we not?—but no one brought his contempt for religion to our attention. We all knew about Andrew Carnegie—after all, he had endowed our local library—but we had no idea that he ridiculed the scheme of Christian salvation. But we didn’t notice Robert Ingersoll at all. After all, the church has had the custodians of wisdom in small town America in its pocket, e.g., the preachers and librarians who were expected to “protect and defend” received tradition and faith. Of course, Christianity continues to be successful. Given what we see happening in the world these days, it’s hard to be optimist that believers are going to “snap out of it” anytime soon. The church has the best gimmick ever: It’s hard to kill something that promises you can live forever if you believe the right stuff. David Madison was a pastor in the Methodist Church for nine years, and has a PhD in Biblical Studies from Boston University. His book, Ten Tough Problems in Christian Thought and Belief: a Minister-Turned-Atheist Shows Why You Should Ditch the Faith,was published last year by Tellectual Press.